Tesla may have convinced drivers that Autopilot is the pinnacle of driver-assistance technologies you can actually buy on a new car today, but Cadillac might have Elon Musk beat. Quietly added mid-year to the 2018 Cadillac CT6, Super Cruise is the first hands-off adaptive cruise control with lane-keeping system on the market. It’s promise is straightforward: on the right road, the CT6 luxury sedan will handle speed, braking, and steering, without pestering you to keep your hands on the wheel. It’s fair to say that there’s a lot of “self-driving car” confusion out there right now. What it boils down to is fairly simple, though: you can’t, currently, buy an autonomous vehicle, even though several companies are running real-world trials of the technology. What you can buy is an advanced sort of cruise control which, with the correct sensors, will aid – but not replace – a human driver. True autonomous cars typically use a LIDAR array: a laser rangefinder that can build a real-time map 360-degrees around the vehicle. They’re incredibly expensive, however – more than Cadillac could afford to include on the CT6. Instead, Super Cruise gets the benefit of LIDAR data thanks to Cadillac doing its mapping homework. Over 130,000 miles of freeways were mapped at high-resolution, predominantly in the US but also in Canada. That data – far more accurate than the normal maps you’d find in a car’s navigation system, and periodically updated over the OnStar wireless connection – is combined with an upgraded GPS sensor in the CT6. It’s 4-8x more precise than the typical GPS sensor you’d expect to find. That refined location data is combined with the Lane Keep Assist, maintaining the car’s position in the middle of the lane. Finally, adaptive cruise control uses radar and other sensors to maintain a safe distance between you and the car ahead. The other half of the equation is the attention system. Super Cruise is fine with you taking your hands off the wheel, but not with you ignoring the road. 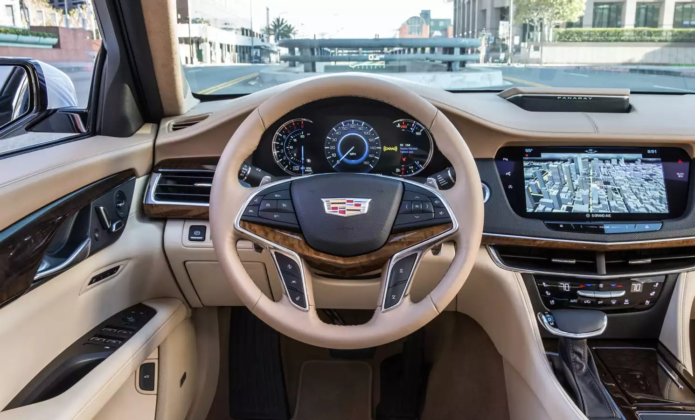 Where rival cars use torque to the steering wheel, or touch sensors embedded into the wheel’s rim, to tell whether your hands are in contact, the CT6 watches where you’re paying attention instead. Two infrared light emitters are built into the black section at the top of the steering wheel. They illuminate your eyes, which are tracked by a small camera mounted on the steering column. As long as the system sees you looking at the road ahead of you, it’s happy. Look away, though, and the green light bar between those IR emitters – which lights up when Super Cruise is in control – starts flashing to remind you to look ahead. Keep ignoring it, and the bar flashes red instead; you get warning beeps too, and the driver’s seat cushion starts vibrating angrily. If the sensation of angry bees under your buttocks isn’t sufficient to get your attention, Super Cruise will give a voice command to take control, then disengage altogether. There’s one more safety system left. If you continue to ignore the controls when Super Cruise has switched off, the CT6 will automatically slow to a halt – with its hazard lights and brake lights on – in the lane. The car automatically contacts OnStar, too, to summon assistance. The biggest drawback with Super Cruise is just where you can actually turn it on. Cadillac has designed the system to handle one specific type of driving: on the freeway. If that high-resolution GPS doesn’t recognize that you’re on one of the properly mapped roads, it won’t allow you to enable the system. There’s a good reason for that, mind. Highways may typically involve high-speed driving, but they’re also predictable: Super Cruise only works on limited access freeways, where there are defined on and off ramps; it has to be divided from opposing traffic. Even with the limits, there’s something magical about Super Cruise. After the first couple of minutes, which are fairly disconcerting, I quickly got used to the car’s ability to deal both with its own place in the lane and the traffic moving around me. Indeed, the desire to use Super Cruise actually led to a change in my driving behavior: if there was a route which included the freeway, and one which did not, I’d opt for the former simply so that I could offload some of the driving to the CT6. I’ve used most of the adaptive cruise control systems with lane-keeping assistance on the market, but Cadillac’s elevates itself from the crowd. The addition of map awareness – the CT6 taking into account the course of the road ahead – and the accuracy of that location makes for an experience that’s astonishingly consistent. There are none of the unexpected waverings that rival technologies can still encounter. Super Cruise had no problems dealing with gaps in road markings as I passed exits and on-ramps, places that competing systems in significantly more expensive cars than the CT6 Platinum struggled with. The question most people asked me, unsurprisingly, was how it compared to Autopilot. Tesla’s system has been controversial from the start, but the core technology is still very impressive. It’s certainly one of the best out there for lane-keeping. However, despite what some drivers seem to believe, Autopilot is still a hands-on affair. Because of that, even with its polish, it’s simply not as compelling – or relaxing – as Super Cruise is. Still, it’s not perfect. There are capabilities I wish Cadillac would borrow from Tesla’s Autopilot, Mercedes-Benz’s Distronic Plus, and other such driver aids. Unlike those systems, the CT6 can’t change lanes just by tapping the indicator stalk. Instead, Super Cruise temporarily disengages when you steer manually into the next lane; once you’re there, you wait a few seconds for the system to lock back onto the lane markings before it takes back control. The light bar flashes blue while that’s happening, lighting up green when you’re safe to let go again. Meanwhile, Super Cruise can’t handle unexpected situations, like roadworks, debris in the lane, or stranded vehicles. At that point you’re expected to handle the steering yourself, just as you would with any other adaptive cruise control system with lane-keeping. Cadillac’s argument is that Super Cruise is intended for what’s often the most tedious sort of driving, helping out on interminable stretches of highway. Judging by the exasperation I felt when I left the off-ramp and had to retake full control, though, for many it’ll be a gateway drug to wanting fully autonomous vehicles. For now, the only way to get Super Cruise is to buy a 2018 Cadillac CT6: it’s standard on the top $85,290 Platinum trim, and a $5k option on the Premium Luxury trim that starts from $64,290. Sadly there’s no sign of Cadillac offering it on any other model – even the brand new XT4 SUV it just announced in New York last month – nor any of the automaker’s GM stablemates getting to use it. That seems like a huge missed opportunity to me. The 2018 CT6 is, at least, a great car to be “stuck” with if you’re shopping for Super Cruise first. It’ll be even better when the new 2019 CT6 V-Sport arrives, though for some frustrating packaging reason you won’t be able to get that V8 all-wheel drive behemoth with the Super Cruise system. Talk about a tough decision to make.